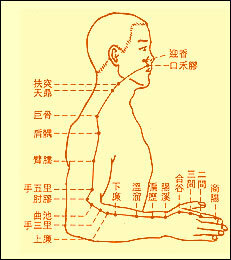 The basic theory of Chinese medicine attempts to explain the nature of life cycle and disease changes. It includes five theories:Yin and Yang, the five elements, how to direct one's strength, zangfu (internal body organs), and channels. It also researches dialectics, and explains why diseases occur, how to diagnose and prevent diseases, and how to keep the body healthy. The concept of Yin and Yang comes from an ancient philosophical concept. After observing the phenomenon, ancient people grouped all conflicting ideas into Yin and Yang. They used this concept to explain how things changed. Chinese medicine used Yin and Yang to illustrate the complicated relationship between various things, such as the different parts of the human body and living things versus nature or society. It was believed that the relative balance of Yin and Yang served as the basis to maintain the normal activities of the human body. If such a balance was disturbed, diseases occurred, thus affecting people's health. The five elements - wood, water, fire, metal, and earth -- emerged from the observation of the various groups of dynamic processes, functions, and characteristics in the natural world. Each of the elements is seen as having a series of correspondences relating both to the natural world and the human body. TCM uses a system of inter-relationships between the five elements to understand how the various processes of the body support and control each other. Because of these inter-relationships, when one of the organs and its associated element is out of balance, the other elements are also affected. This imbalance will manifest in the individual with many different signs and symptoms. It may show in the facial color, the sound of the voice, or a change in the emotional state as well as disharmony in the functioning of the connected organs. The theory of directing one's strength focuses on how various components such as astronomy, meteorological phenomena, and climate would affect health. This theory consists of two parts, five strengths, and six climatic factors. The five strengths, namely the strengths of metal, wood, water, fire, and earth, refer to the different seasons of the year such as spring, summer, long summer, autumn, and winter. People regarded wind, coldness, summer, rawness, dryness, and fire as the six elements of the climate. This theory tried to predict climatic change and how disease occurred by parameters in astronomy.